Improve your recruiting process, save time and get the best candidates. Test Software developers in what is more important, their coding skills. 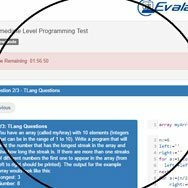 Evalart provides programming questions where developers have to actually code…..
Tests that meassure inteligence, abstract thinking, attention to details and other aptitudes. Classic multiple alternative or open text questions to test for specific theoretical or practical knowledge in different areas. 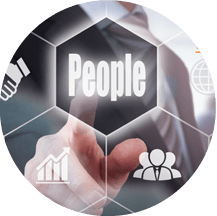 Psychometric tests that allow to evaluate various characteristics of the personality to identify those candidates that fit the position as well as the company culture. You can create your own tests with our powerful Questionnaire Builder, creating your own tests, questions or doing the combinations you want. Evalart’s on-line evaluations can pre-filter candidates, identify the best candidates and significantly reduce the number of candidates who require an interview (online assessments allow up to 80% of applicants to be filtered). 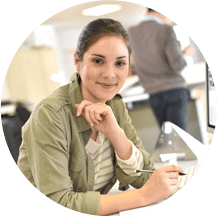 You can start taking online assessments right now with our free trial, getting access to our test libraries and enjoying Evalart’s ease of use. 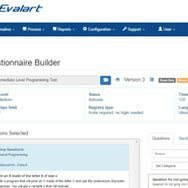 Evaluate the characteristics required for the position using the questionnaire libraries or creating your own evaluations: Intelligence, verbal aptitude, knowledge, programming skills … whatever you need to measure, you can do it with Evalart. Evaluar a los candidatos con Evalart es muy simple. Todo el proceso consta de solo 4 pasos donde se eligen los cuestionarios que se quieren utilizar, se crea un proceso de selección para enviar los cuestionarios a los candidatos, estos responden a los cuestionarios y los resultados son inmediatamente visibles en Evalart. We will soon add testimonials from our customers about Evalart and its experience on the platform. Start using Evalart for free with our free trial and see all what Evalart has to offer to improve your recruiting process. 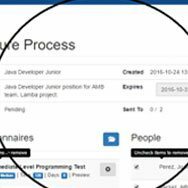 Watch a video and see how easy it is to use Evalart in a recruiting process. Request a demonstration of Evalart to learn more about all its characteristics. The sample test allows you to see the characteristics of the online evaluations, as a candidate would see them.